J. W. Martin, better known as the ‘Trent Otter’ is one of angling literature's best-loved anglers. 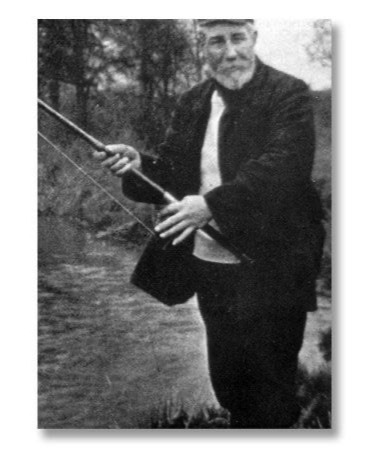 Martin wrote often about fishing in the Trent, Derwent and many other Midland rivers. Perhaps one of the greatest of all-rounders, Martin depicts a gentle way of fishing in My Fishing Days and Fishing Ways as he pursues pike, perch, trout, barbel, chub and other species. ‘The pocket of the working-man angler has been constantly before me; he has not much money to buy an expensive outfit, nor yet for every fresh fad or fancy, that are being constantly brought out to wheedle his hard-earned cash from his pockets. The principles I lay down are those of economy, based upon a practical knowledge and experience, extending through many years, and under peculiar advantages. I have not the least hesitation in saying, that a careful study of this part of my subject, will be a saving to the angler of many shillings during a single season.